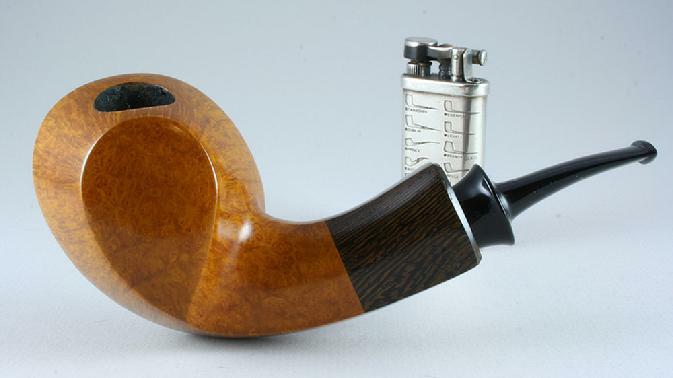 It is my contention that briar is a beautiful wood and within each piece there is a particular pipe waiting to be created to accentuate the grain for the smoker's enjoyment and aesthetic pleasure. Pipe making is nothing short of pure joy and I trust that those enjoying my creations derive as much pleasure from them as I have in manipulating a block of wood into a fine smoking instrument. On June 12th, 2012 I had to put my pal, Boo, to sleep. She was my faithful companion, marketing director, chief designer, scheduled commissions, made briar choices, advised on stain colors and my most ardent supporter. She was my shadow, always either in my lap, by my side, at my feet under the desk (either in my office or shop). Part of my daily routine and heart are gone.